The centerpiece of our diversity and inclusion efforts is our longstanding NIH funded UNC Initiative for Maximizing Development (IMSD) program. The UNC IMSD program aims to increase the number of PhD trainees from groups historically underrepresented (UR) in the biomedical sciences, and to foster these trainees transition to successful scientific careers. Those with questions about the program should contact Dr. Ashalla Freeman or Dr. Jessica Harrell, co-directors of IMSD. 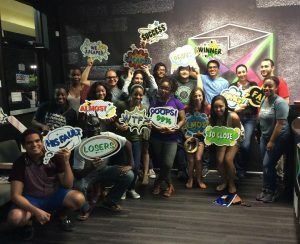 IMSD students after an escape room experience. All students are invited to join our IMSD community (UR and non-UR students). The IMSD family of over 70 scholars provides a support system that enriches the graduate career of each participant. Participants meet regularly for advising, socials, a yearly retreat, a research symposium, and a holiday dinner. Visit the IMSD website to learn more about the program and connect with our inclusive community of scholars. The IMSD program provides a blend of academic support, professional development, community, and mentorship to nurture self-confident, highly competitive scientists. Scholars in our program have access to monthly cohort meetings during the first year, and quarterly cohort meetings thereafter. The program also sponsors workshops, provides academic coaching as needed, and advises scholars and their mentors throughout the duration of training. UR scholars are succeeding at UNC with a retention rate of over 85%. UNC BBSP representatives attend a number of recruiting conferences each year including ABRCMS and SACNAS. Interested students are invited to connect with us at these conferences, via email, or by applying to our Preview Weekend. Through our Diversity Affairs Office, we can pay the BBSP application fee for qualifying UR applicants. To learn more about this resource, please contact the Director of Diversity Affairs at imsd@unc.edu.